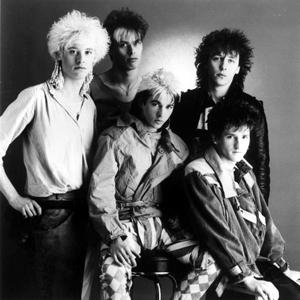 Kajagoogoo is an English pop band best known for its first single, "Too Shy", which reached Number 1 in the UK and Number 5 in the U.S in 1983. The single was produced by keyboardist Nick Rhodes of Duran Duran and Colin Thurston who was, at this time, Duran Duran's in-house producer. The band was founded in Leighton Buzzard in 1979 as a four piece avant-garde instrumental group called Art Nouveau, with Nick Beggs on bass guitar, Steve Askew on lead guitar, Stuart Neale on keyboards and Jez Strode on drums. The band was founded in Leighton Buzzard in 1979 as a four piece avant-garde instrumental group called Art Nouveau, with Nick Beggs on bass guitar, Steve Askew on lead guitar, Stuart Neale on keyboards and Jez Strode on drums. Art Nouveau released a track called "The Fear Machine". The single sold a few hundred copies, and was played on the John Peel show, but the band could not get a record deal. In 1981, they advertised for and auditioned lead singers, and finally chose Christopher Hamill. He made his profile, and therefore that of the band, catchier by using an anagram of his surname for his stage name, becoming Limahl. The name of the band was then changed to Kajagoogoo. Writing out the phonetics of a baby's first sounds gave them "GagaGooGoo". With a little bit of "casual" alteration it became Kajagoogoo. The band attracted the interest of three record labels (and Duran Duran's Nick Rhodes) while performing at the Embassy Club in London. The band was signed to EMI in July of 1982, and Rhodes was signed to produce their first album, White Feathers. The debut single "Too Shy" was released in January of 1983 and went to the top of the charts (before any of Duran Duran's singles had done so, Rhodes noted ruefully). Follow-up releases "Ooh to Be Ah" and "Hang on Now" both reached the UK top twenty as well. The band fired Limahl in 1983 after a huge disagreement, with Beggs taking over as singer, but the hits dried up completely. They tried a relaunch as Kaja in 1985 which failed, and they broke up for good in 1986. Limahl enjoyed a briefly successful solo career, scoring a hit with the movie theme song "Neverending Story" in 1984. The band briefly joined forces again on VH1's Bands Reunited (26 January 2004, Season 1, Episode 6) and performed at the Scala club in London, England for the show. In 2007, Nick Beggs, Steve Askew and Stuart Neale continued to play together as Kajagoogoo. June 24th, 2007 saw the release of "Rocket Boy" the first Kajagoogoo single in 22 years. The single received airplay on Steve Wright's Radio 2 show in the UK. In September 2007 Kajagoogoo performed the opening set with other 1980s acts at Retrofest at Culzean Castle in Ayrshire, Scotland. They have since formally reunited. In February 2008, Kajagoogoo, under new manager Bradley Snelling, announced their reunion. on April 7, 2008 a new contract was signed with all of the original band members, Nick Beggs on bass guitar, Steve Askew on lead guitar, Stuart Neale on keyboards, Jez Strode on drums and Limahl on vocals bringing the band back together officially for the first time in 25 years. The website was created to mark the reformation of all original 5 band members, Nick, Limahl, Jez, Steve and Stuart. Here you will find all the latest information on the band, live dates, band member info as well as some official Kajagoogoo goodies, mp3's, photos, downloads and more!